Speaking of flying, if you�re in the area around York and like Art Deco then why not take a trip to the National Railway Museum? They currently have the rather impressive Duchess Of Hamilton engine for viewing. This is an impressive streamlined locomotive, a truly stunning example of Art Deco designs and styles and dates c1938. Click here to visit the museum�s website and see more. 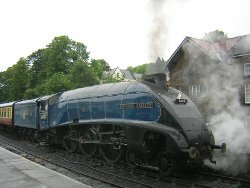 The streamlined appearance of this locomotive is very similar to that of the Sir Nigel Gresley engine that can be seen on the North Yorkshire Moors Railway. This engine was originally built in 1937 and was the 100th Gresley Pacific engine built. There are reported to be only six of these engines remaining worldwide - four here in the UK and the other two in North America. To read more about the North Yorkshire Moors Railway - click here. If you had any interesting outings over the holiday period then do get in touch and let us know.